If you are running a business, you have a lot invested in the success of your project. While there are certainly details out of your control, you’ll want to manage what you can control as best as you can in order to ensure your business is a success. One such way you can promote success within your company is to manage your workspace to optimize productivity. Follow the steps below to ensure your office space is promoting productivity! This point may seem obvious, as most offices have a designated Break Room or Conference Room with purposes of their own but often times, especially in smaller offices, spaces are used for various purposes and it can offset productivity. If your office allows it, allocate a certain amount of space specifically for breaks or other non-work related activities, and other space for work-related activity. “Task association” happens in your brain when you are in a space that you consistently use for one particular task. When one space is used for multiple purposes, your brain will either associate the intended work space with fun or could not have the strong association with a workspace as it would if that is all the space is used for. In order to optimize productivity for your employees, keep these tasks in separate areas of your office. The issue of productivity is largely psychological, for that reason, it is important to think in more depth. For example, it may seem like a wise business decision to purchase the cheapest, most accessible furniture while this may be harmful in the long-run. Ensuring your employees have a workspace that will help, not hinder their productivity is essential in guiding your business to success. Employees with large desks are likely to be more productive and less likely to be distracted by clutter. Ensure your employees have plenty of space to surround themselves with the materials necessary to do their job. Our favorite desk available in our showroom is a part of the ThinkQuietly collection from Darran. With its size, this desk is perfect for employees who work closely but it also provides features that prevent distractions when it's time to focus, such as acoustic material that turns down peripheral sound. Learn more about this product here! Chairs are also an important investment and can drastically affect an employee’s performance. Choosing a comfortable chair that allows employees to make adjustments to fit their desk and personal preference will allow them to focus on their work instead of periodically adjusting their chair. 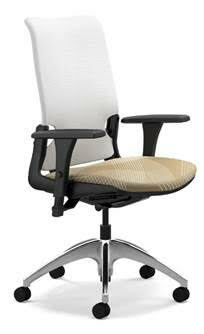 Our most highly regarded chair in stock is Highmark's InSync chair pictured below. This model adjusts to your movement, moving with you to provide comfort even when you change positions. It is available now at our Methuen showroom now! With any size office, it is essential to be mindful of the way you organize the space. Using space correctly is sure to increase productivity. From something as simple as inviting natural light into office space to organizing your employees based on who needs to communicate with whom most frequently, this organization can save your employees time and create more overall productivity. This task isn’t easy so let the professionals handle it! Ideal Office Solutions offers Design Services to offices across Massachusetts. We also have a range of products available. Visit our Products Page to view our selection and contact us with inquiries!